1934, Hermann T. Beck, from design by Joseph L. Roop. La Brea Tar Pits, Page Museum, Los Angeles. 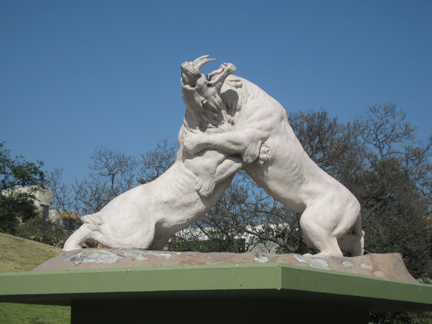 The sculpture was described in Scott, Eric, "They Live Again: Sixty Years of Sculpture in Hancock Park" Terra, volume 24, no. 1 (Sept/Oct. 1985): 23-30, and in McNassor, Cathy, Los Angeles' La Brea Tar Pits and Hancock Park (2011), pp. 53-55.